Billings is the fictional narrator of The Rikers Island Series, a sprawling horror franchise set on present-day Rikers Island. Its pseudonymous author Fred S. Kreider claims “experience in law enforcement” and dedicates one volume “to all my buddies who can’t get enough of my jail stories.” It is unclear whether Kreider is a past or present employee of the New York City Department of Correction. Kreider nonetheless provides a richly detailed and reasonably realistic portrayal of the facilities at Rikers Island and the work lives of the guards who inhabit them. Simultaneously, Kreider’s books bear the unmistakable watermark of a historical moment when the monstrosities of Rikers Island stand denuded before a general public simultaneously disgusted with the facility and all it represents, and hopelessly divided on what to do about it. To date Kreider has released two volumes, with a total of six projected over the next two years. 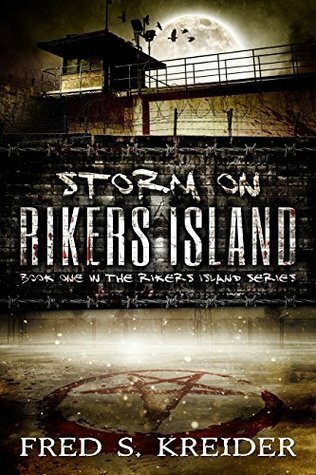 I will review them individually as they appear, beginning with the first, Storm on Rikers Island (Corporate Cult Press, 2018). For the reader averse to spoilers, in the final four paragraphs I reveal the novel’s ending. Storm on Rikers Island begins with the sounding of an alarm. Unconcerned with any picture bigger than his own wellbeing and that of his family, Billings desires nothing more than to “do eight and skate,” returning to his fiancée in one piece after an uneventful shift. Yet he is part of a “probe team” and at the sounding of each alarm must suit up in riot gear and arm himself with a celayaton baton, heavy plastic shield, and powerful pepper spray, prepared for a violent encounter with prisoners. Arriving on the scene, Billings learns the prisoners in a maximum security block have barricaded the gate, their motives unclear. True to Kreider’s guard’s-eye view, the unconvicted pretrial detainees Billings guards on Rikers constitute an amorphous mass of “criminals” represented not as distinct human beings, but an incessant chorus of complaints and demands running the gamut from minor annoyances to murderous vengeance. For Billing and his colleagues, callousness to the suffering of prisoners becomes just another necessary part of the job. Surely enough, a captain congratulates Billings on his restraint: “Good job not following up on your stick. You could have easily tagged him another time or two after what he tried to do with the chair.” But just as predictably, extensive and time-consuming “use of force” paperwork is in order. “I suppose it’s a necessary evil,” Billings later reflects. “The department has to cover their asses legally. Everything we do here at Rikers is about legal liability or about making our supervisors look good in the press. Every step we take is analyzed and reviewed by a bunch of Monday-morning-quarterbacks.” The brutality of guard life disappears into the paperwork, while the paperwork becomes itself a source of great terror. In addition to the paperwork and all it represents, Billings and his colleagues live in constant fear of the prisoners they guard. They develop a culture of victimhood and approach the outside world with a siege mentality. “You spend your days surrounded by a small army of thugs, working crazy long hours of mandatory overtime,” Billings explains. “You are physically and mentally exhausted, swimming in an ocean of violence and stupidity.” In their world, prisoners’ requests for basic amenities may contain the seeds of manipulation or constitute the pretext for threats. To patrol the halls is to risk being splashed by vile concoctions of bodily fluids. Patrols must be calculated not just to surprise prisoners who may memorize the schedule, but to satisfy administrative requirements that are at times technically impossible if one ever wants to sit down. When a guard can finally sit down, they might find a cockroach crawling up their pant leg. If they fall asleep, they can be penalized by administration, or victimized by prisoners, who seem particularly keen on ejaculating on a sleeping woman. Ranking guards approaching retirement complain incessantly, do as little work as possible, and can hardly be bothered to open the doors they are paid six figures to guard. “The wardens and politicians take all the credit for our accomplishments,” Billings notes bitterly, “while we officers take all the blame for anything that goes wrong. The higher ups are cowards with no balls who only care about never rocking their own boats.” While seniors do as they please with few consequences, a rookie like Billings can be terminated on the slightest pretext. With all the anger of the so-called silent majority Billings inveighs against an inchoate enemy comprised of just about anybody outside his family and small set of trusted guard friends. Billings underscores time and again that cameras are always watching. “We are instructed to ‘tell a story’ in front of the cameras in order to protect ourselves against litigious or disciplinary actions,” he confides to the reader. “‘Make a movie,’ they would tell us.” Ranking guards are happy to avoid scandal altogether by abetting their inferiors wherever possible. However, at the end of the day, if blame must be placed, nobody up the chain of command is falling on their sword for a lowly guard. Accordingly, paperwork must always be in order. Mountains of it. The slightest deviation from established protocol can prove disastrous if something goes wrong and the paperwork doesn’t add up. Unseen and unheard, some nefarious prisoner, malevolent colleague, or tragic force of fate itself is always conspiring to destroy the humble jail guard, whether they know it or not. This is an ordinary day for Billings, before any supernatural force has the chance to slink onto the scene. Of course Billings and his colleagues do not subject themselves to this daily ordeal out of the goodness of their hearts; “you get a good salary, health benefits, paid vacations, holiday bonuses, longevity pay, hazard pay, and a nice pension handed to you when you’re done.” While these incentives help the guards drag themselves out of bed, the perks become cold comfort as the expanse of the workday stretches ahead of them as a vanishing horizon of boredom, bureaucracy, and brutality. Guards degrade their bodies and souls through punishing work regiments and toxic social relations, mutilating themselves most of all by denying the humanity of those they guard. By this point you may be asking: When does this become a horror novel? Well, if horror is understood in the canonical sense, the answer is about halfway through the book. After detailing the hardship and debasement of the island’s working conditions in scrupulous detail, Kreider belatedly and almost begrudgingly introduces Norman Henkes, a satanic serial killer who has recently butchered a family of five, including the children aged nine, seven, and three, before tossing in an elderly couple for good measure. Satanic symbols adorned the crime scenes and the case has caused a citywide sensation. Naturally, Henkes is to be interned at Rikers just as the storm approaches the island. A colorless amalgamation of Hannibal Lector and Norman Bates, as his name is perhaps meant to suggest, Henkes is a thoroughly uninteresting character. Thankfully, the supernatural psycho killer takes up remarkably little space in the book, and accounts for even less of the terror. Despite transmuting himself throughout the cellblock practicing mind control, murder, and generally acting like a creepy jerk, the everyday workings of Rikers Island prove a tough act for the horror fiend to follow. Kreider seems to intuit this, based on how little page time he gives the story’s ostensible villain. Henkes’ dismembering a fellow prisoner and rearranging his corpse in a satanic patterns, for instance, reads as profoundly underwhelming, and even downright campy, amid the general climate of fear and brutality characterizing a normal day in the facility where Henkes is prisoner. Moreover, to the reader who has come to empathize with the deftly-written Billings, far scarier than any details of Henkes’ grisly murder is the possibility that it occurred at a time when Billings or a colleague was supposed to be on patrol but was instead sleeping, which could be subsequently revealed upon examination of the paperwork, resulting in serious disciplinary action. In fact, the most frightful scene in the entire book comes when a guard sneaks off duty to take a nap in a vacant cell, placing Billings in charge of waking her in time to slip back to work undetected. Instead, Henkes uses mind control to force her to remove her clothing and offer herself to a blushing Billings whilst masturbating furiously. Then it happens – the Assistant Deputy Warden has arrived! How are they going to explain this? The Henkes story itself unfolds with the remarkable bureaucratic sterility that constitutes the novel’s atmosphere, rendering the brutal banal and the banal truly terrifying. Henkes has concocted a plan to escape Rikers Island, and tries to conscript Billings into helping him by threatening the latter’s fiancée and unborn child with his supernatural powers. An exasperated Billings pleads with Henkes that even if he wanted to help, it would be impossible for him to smuggle the high-profile prisoner off the highly-fortified island. But the spectral Henkes has a different conception of escape. “I will clearly threaten your life,” he informs Billings; in response, Billings needs only to kill him. Death will be his escape from Rikers Island. Faced with a credible threat to his family from the supernatural killer, Billings plays along, slaying Henkes in an apparent act of self-defense. Henkes is true to his word, even conveniently reactivating the cameras he had disabled in order to carry out a sacrificial killing undetected. “Fortunately,” Billings recounts, “the cameras had started working again right before the incident and the whole scene was recorded. He clearly attacked me, and my life seemed to be in imminent danger. I was assured by everyone that his actions were considered to be life threatening and that my self-defense was completely justified. The department’s legal team will happily represent me if anyone challenges the correctness of my actions. Everyone has my back. I have nothing to worry about.” Yet Billings does in fact have one thing to worry about. While Henkes perishes in body, in spirit he is transmuted into a curious choice of vessel: a young boy visiting his incarcerated father at Rikers Island. Henkes, we learn at the novel’s end, will be back. 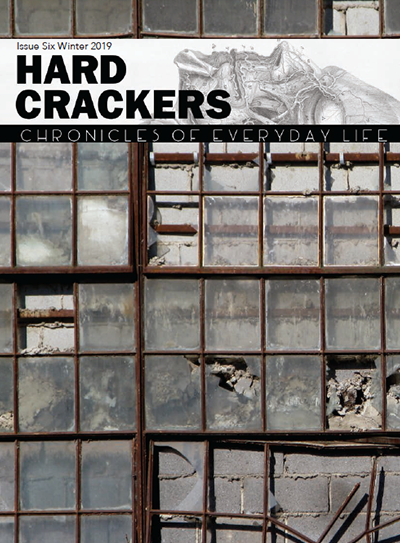 Jarrod Shanahan is an editor of Hard Crackers and co-author, with Jayne Mooney, of the forthcoming Rikers: A Social History of New York City’s Island of the Poor.